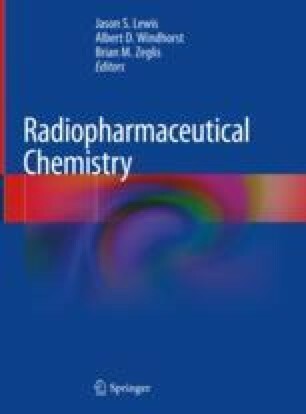 Of all the cyclotron-produced positron-emitting radionuclides, 18F is by far the most widely used both in the preclinical and clinical settings. The use of 11C has increased significantly since the 1990s due to the proliferation of biomedical cyclotrons and the radiochemical possibilities of radiopharmaceuticals that can be directly produced in the cyclotron target. The application of other short-lived positron emitters—including nitrogen-13 (13N; t1/2 = 9.97 min) and oxygen-15 (15O; t1/2 = 122 s)—has remained somewhat more restricted. Because the stable analogues of both 13N and 15O—14/15N and 16/17/18O—are present in most biologically active molecules, the incorporation of these radionuclides into imaging agents has the potential to yield useful and interesting alternatives to 11C- and 18F-labeled radiopharmaceuticals. In this chapter, we cover the production methods used to create these two radionuclides as well as the radiochemical methods that have been developed for incorporating 13N and 15O into radiotracers. In addition, we provide numerous examples of 13N and 15O radiosyntheses from the literature, with particular emphasis on the aspects of the chemistry of these two radionuclides that differs from that of their non-radioactive isotopologues. Two works in particular that we believe illustrate applications of 13N and 15O that differ from conventional perceptions of radiochemistry are discussed in detail. Finally, future opportunities for the production and use of these two radionuclides are addressed, taking into account the impact that recent technological advances may have in the field.